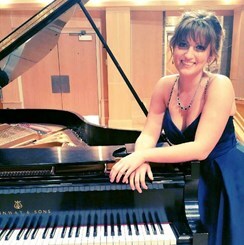 Ava Taillon has been teaching voice and piano lessons in the Bel Air area for 5 years, and has been with Music & Arts since 2014. She first received an Associates degree in Music from Harford Community College, and now also holds a B.S. in Music Education from Towson University. While studying at Towson, she was also able to gain experience teaching group classes including General Music, Music Theory, and Chorus in the public school system. "I encourage and uplift my students to do and try their best," says Ava. "I really strive to establish a comfortable and safe learning environment for all types of learners so that everyone feels respected and appreciated. I like to meet the student where they are in their abilities and work with them so they are able to reach their own personal musical goals." Request Lessons with Ava today!